May 15, 2018 - The Better Business Bureau (BBB) serving Central, Northern and Western Arizona has selected Arizona Foundation Solutions as a finalist for the 2018 Torch Award for Ethics, the most prestigious honor the BBB can present to a business! 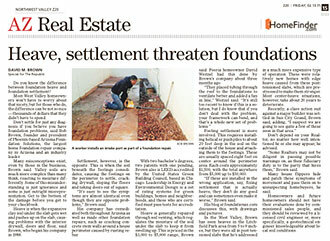 February 13, 2015 - Do you know the difference between foundation heave and foundation settlement? Most West Valley homeowners won't have to worry about that nicety, but for those who do, the difference can be not so nice - thousands of dollars that they didn't have to spend.